Our Junior Program helps students to reach their full potential at a young age. Students will learn life skills that will benefit them now and as they grow into adults. Tae Kwon Do teaches individuals to channel their energies in a good way and not to turn it into violence. Our teaching methods help children to always be mentally and physically prepared and physically fit, with an emphasis on self-defense. We teach our students that the benefits of Tae Kwon Do is not only a superior art of self-defense, but that it trains the mind and spirit as well. Our program is designed to help children develop confidence, discipline, and respect to self and others. 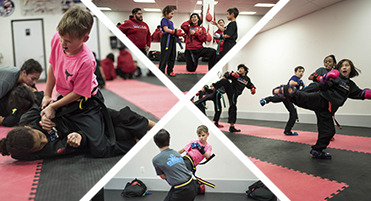 With its practical means of self-defense, physical conditioning, and character building, our Junior program offers a total fitness class integrating mind, body, and spirit. Students in the Junior Program will become better students at school, stronger listeners at home, better young adults in society, and more ambitious about their future. Tae Kwon Do will help them improve their abilities in other sports activities as well. Additionally, it will allow them the benefits of confidence, self-esteem, and an outlet to channel their energy. Our teaching methods have been designed to help pre-teens learn quickly and retain what they have learned. We play games and use other exercises and activities to keep the class enjoyable and dynamic. Respect for the learning process and for teachers such as bowing and handshakes, and addressing them with "Yes, Sir!" and "Yes, Ma'am!" This program also teaches the importance of goal-setting and follow-through. This is reinforced through a test at the end of the program in which students perform in front of the Master Instructors, Instructors, parents and fellow students. It also teaches the students how to set goals at every belt level, and the actions and discipline needed to achieve them. Learn more about benefits your child can get from our Junior Program.